She was once young and vibrant, a beautiful woman with a promising future. But a dark and dangerous secret forced her to leave everything—and everyone—she cared for. Now she lives alone in a quiet riverside town, her heart breaking as she watches the world change from the shadows. All that is left to bring her joy is her stunning, glorious voice, a voice that enthralls anyone who hears it, including a student named Betsy. Kind and thoughtful, Betsy is determined to help the woman live her life to the fullest again. But coming out of the dark—and exposing her heart to hurt once more—will not be easy . . .
My first book by Josephine Cox. Not really how I expect it to be. I kinda expect a thriller ala Sandra Brown style for some reason! However, am not really disappointed by it...just wasn't my expectation only. Songbird is more like a female drama. Basically it's about the life story of this great singer and how she ended up where she is today. I find some of the plot a bit far fetched and some part over dramatic but overall it is not too bad. Character development could have been better too but I must remember that the characters from a different generation from today's generation so my opinion is that outlook in life and responses to situations would certainly be quite different from women of today. 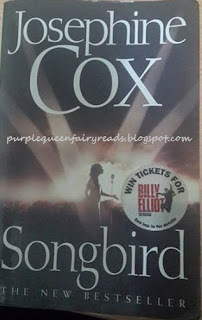 I have another title by Josephine Cox somewhere in my TBR pile. Perhaps I shall check it out and see if I would like that title.